Kingdom Falconry is based and located at Crag caves, Castle-island, Co. Kerry, 2km from the town. They offer you the unique opportunity to get up close and personal with a variety of very majestic and awe-inspiring birds of prey. One of these birds is an Eurasian eagle-owl a fantastic bird that was just wonderful to get very close to. Kingdom Falconry can be contacted from this link. If you are in county Kerry and near Castle-island and have sometime , I would very much recommend dropping in to meet these birds. The Eurasian eagle-owl (Bubo bubo) is a species of eagle-owl resident in much of Eurasia. It is sometimes called the European eagle-owl and is, in Europe, where it is the only member of its genus besides the snowy owl, occasionally abbreviated to just eagle-owl. In India, it is often called the Indian great horned owl, though this may cause confusion with the similarly named American bird.It is one of the largest species of owl, and females can grow to a total length of 75 centimetres (30 in), with a wingspan of 188 centimetres (74 in), males being slightly smaller. This bird has distinctive ear tufts, the upper parts are mottled black and tawny and the wings and tail are barred. The underparts are buff, streaked with darker colour. The facial disc is poorly developed and the orange eyes are distinctive. The Eurasian eagle-owl is found in a number of habitats but is mostly a bird of mountain regions, coniferous forests, steppes and remote places. It is a mostly nocturnal predator, hunting for a range of different prey species, predominately small mammals but also birds of varying sizes, reptiles, amphibians, fish, large insects and earthworms. It typically breeds on cliff ledges, in gullies, among rocks or in some other concealed location. The nest is a scrape in which up to six eggs are laid at intervals and which hatch at different times. The female incubates the eggs and broods the young, and the male provides food for her and when they hatch, for the nestling’s as well. Continuing parental care for the young is provided by both adults for about five months. 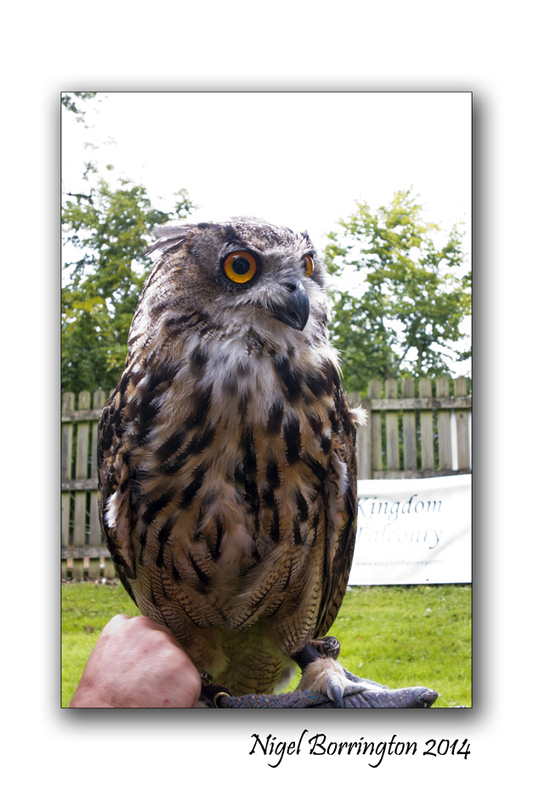 There are about a dozen subspecies of Eurasian eagle-owl. With a total range in Europe and Asia of about 32 million square kilometres (12 million square miles) and a total population estimated to be between 250 thousand and 2.5 million individuals, the IUCN lists the bird’s conservation status as being of “least concern”. This entry was posted on September 19, 2014 by nigel borrington. 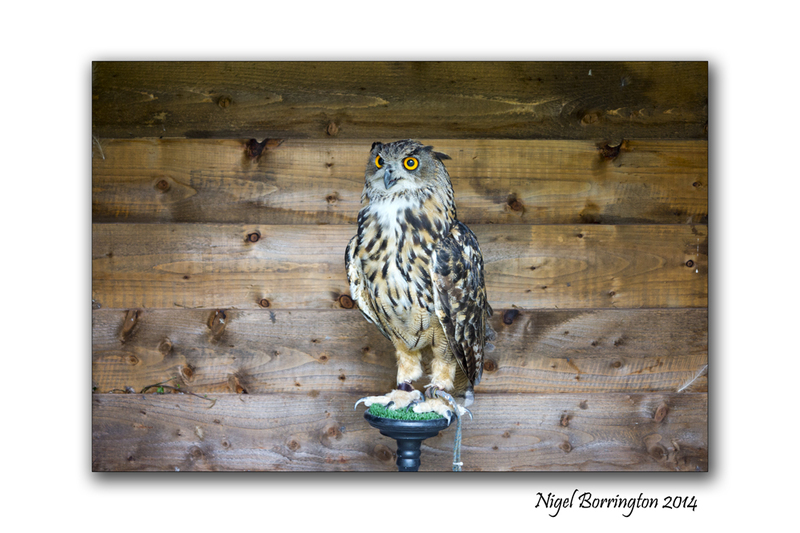 It was filed under events photography, Gallery, Nature and Wildlife, Nigel Borrington and was tagged with birds of prey, Eurasian eagle-owl, irish nature and wildlife, Irish photography, kerry, Kingdom Falconry, Nigel Borrington, snowy owl. Some birds make you say wow and some strike you dumb. On different days owls can make you do both. She’s spectacular!! Those amber eyes…..soft, detailed feathers like an oil painting……and her alert, direct gaze. What a treat to visit with her, Nigel. Must have been thrilling :).